In this Google era of information — a world dominated by words — Instagram empowers your brand to better tell visual stories. Visual storytelling is not new; it’s retro — think cavemen-drawings and hieroglyphics or even picture books from our early reading years. We’re visual. Until recently, taking photographs was an expensive and timely venture: equipment, film, processing. With everyone and their mom (literally) holding a smartphone, we’ve all become digital storytellers. Video and photographs are no longer out of our reach. As people, we share the mundane moments along with our triumphs over social media. It’s something that takes us seconds to do. Instagram is one of those platforms where a brand can be that much more human. And of course, a WordPress Instagram plugin is available. Instagram isn’t just hot with the 18-24 year old crowd, though as this group matures they’ll continue to prolifically use this tool. According to Pew Research, “55% of online adults ages 18 to 29 use Instagram.” That’s over half of all young adults under thirty. But it doesn’t stop there. In fact, the fastest growing selfie demo on Instagram is Gen X. Gary Vaynerchuk recently remarked that selfies are rising fastest with women over 40. Businesses — both big and small — are using Instagram as a way to show their operations from a behind-the-scenes perspective. They’re using Instagram to deliver authenticity. One such company, Buffer, allows a different team member each week to take over the account. Follow them and you’ll discover the uniqueness of each team member! Beyond just features and benefits, Buffer is delivering on Social Value. Taking this approach to Instagram gives people a sense of company culture — of who you really are. Instagram shots, artfully considered, will allow you to build loyalty, have fun, and reach new, untapped demographics. In many ways, we believe Instagram is the best of Twitter and Facebook. It offers the ability to cover events live, provide perspective into the team’s daily living, or share pictures for the sake of art. All of this comes without the drama associated with Facebook or the annoying game invites. What’s not to love? A very important — yes, very important — advantage Instagram has over Facebook is organic reach and post delivery to fans and followers. Where Facebook posts reach about 6% of a brand’s fans, Instagram posts reach 100%. If you read the latest on Mashable, you may think that Instagram will devolve into Facebook. “Instagram users, you might want to sit down. Instagram may soon be messing with your timeline, showing photos not based on chronological order, but based on popularity and other social signals. It’s something they’re testing. But I wouldn’t worry too much about this. It may change the frequency of your posting, but the culture of Instagram has not changed. People follow brands because they want to. That’s a rare opportunity. The fact of the matter is that the one thing you can count on with social platforms is change. They will change their design, user interface, and rules, for lack of a better term. This is why it benefits businesses to be early adopters. Have you wanted to embed your Instagram feed onto your WordPress site but didn’t know how? Today’s your lucky day. Instagram Feed is a perfect way to display the feed of each member of your team on your about page, highlight clients on your portfolio page, and even level-up listicle posts. Go to your WordPress Dashboard. Go to Plugins, then add new. In the keyword box, search for “Instagram Feed.” Click Install and then activate the WordPress Instagram plugin. 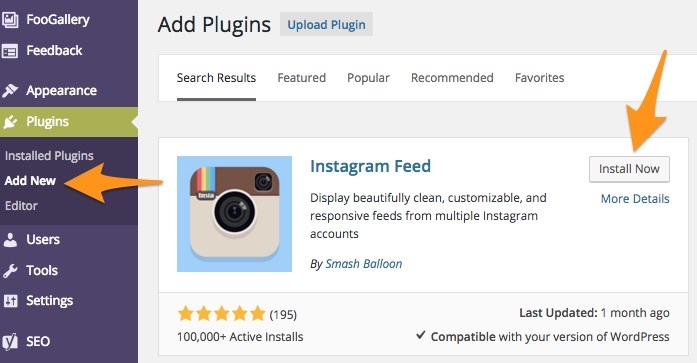 Install Instagram Feed from the Add Plugins functionality in your WordPress Dashboard. In the side of your dashboard, find Instagram Feed. This is where you set up your Instagram account and give the plugin permission to access your account. 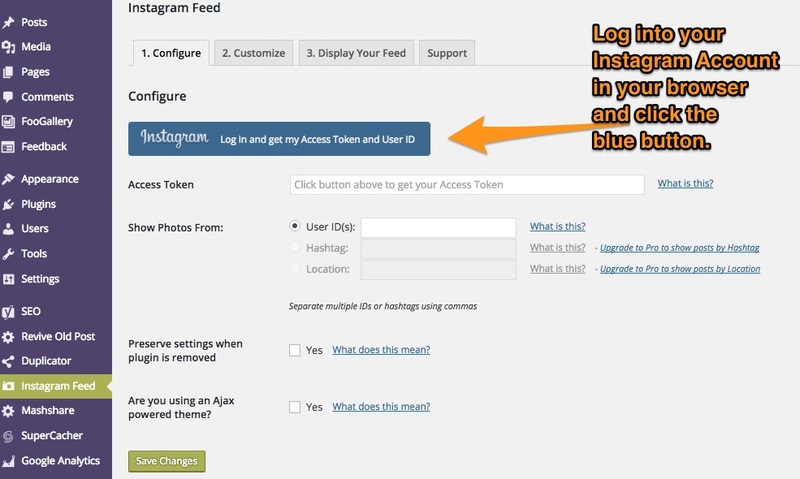 Login to your Instagram account from the Plugin Settings panel to get your access token and your User ID. It will display the access token and user ID. Copy those numbers into the fields. After you login to Instagram in the Plugin Settings, copy and paste the token and user ID into the respective boxes. 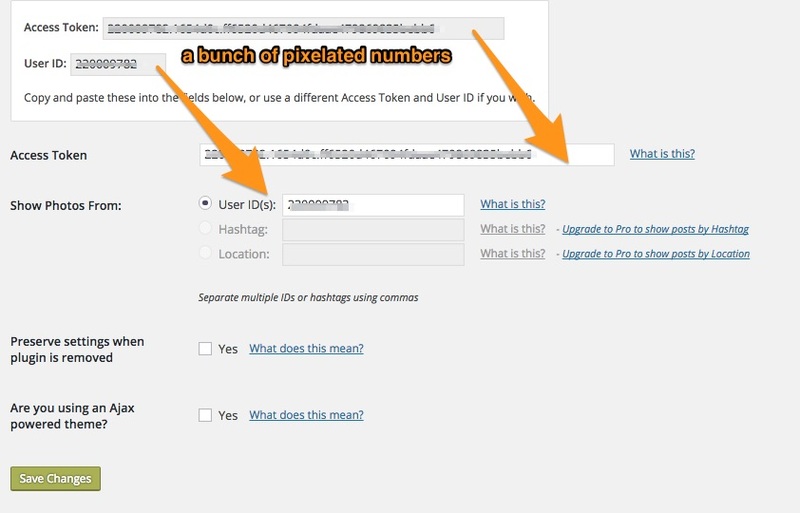 This website allows you to find another Instagramers’s user ID. 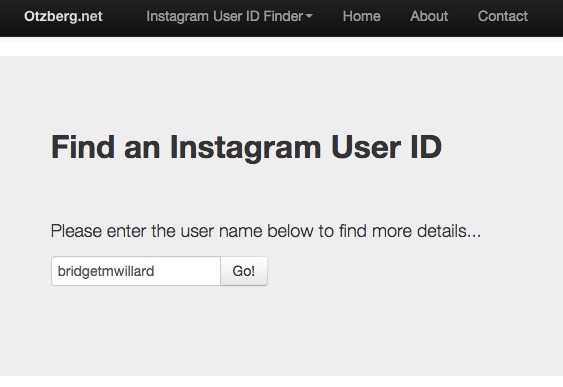 This is another way to find an Instagram user’s ID by their username. 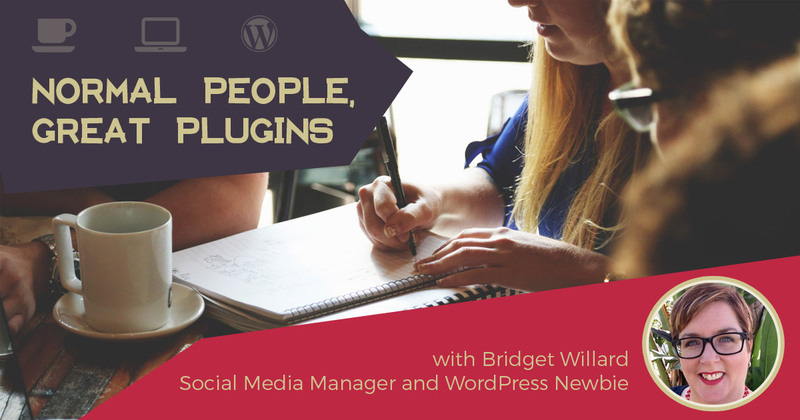 The pro version of the Instagram WordPress plugin allows you to display photos by a specific hashtag. For instance, WordCamp sites might take advantage of this functionality to aggregate Instagram photos with specific WordCamp hashtags. The pro version also features a lightbox and caption display. Remember, WordPressers — save the changes! Proceed to the next step to customize your feed; many of the options are for Pro accounts only. We typically encourage website builders and developers to consider the Pro version of plugins; this one is no different. The functionality I find nice is the ability to set the height (pixels) and width (percentage) of the feed, the total number of photos, columns, and sort order. This WordPress Instagram plugin makes it easy. Once these initial parameters are set, the next step is setting the display options. There are several shortcode choices. From my perspective, the one shortfall in this plugin is the fact that it does not create the shortcode for you. For those familiar with shortcode, it’s no issue. I spent about an hour before I came up with a shortcode that worked the way I wanted it. Or, I can decide to put my shortcode in a text widget for my sidebar. With display width set at 100%, the photos are properly sized for my 500px box. Easy! To do this, go to widgets, add a text widget, and paste the shortcode. 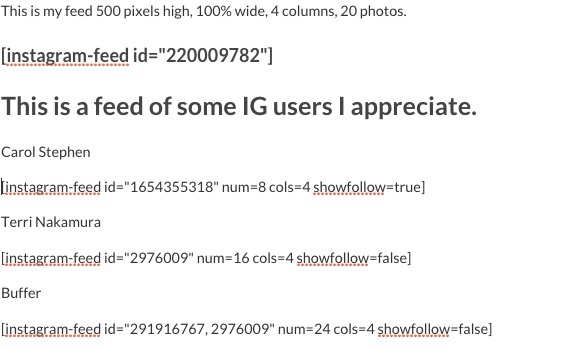 This is how the Instagram Feed shortcode displays in a sidebar widget as seen on bridgetwillard.com. Then, when a site visitor clicks on the image, it will take them to the permalink on Instagram. For even more learning, I also created a page with several shortcodes to highlight Instagram Users I value as an example. This is the best configuration I found for displaying the Instagram Feed for other users on a single page — 8 total, 4 columns. Here is how a four-column shortcode displays in full-width. 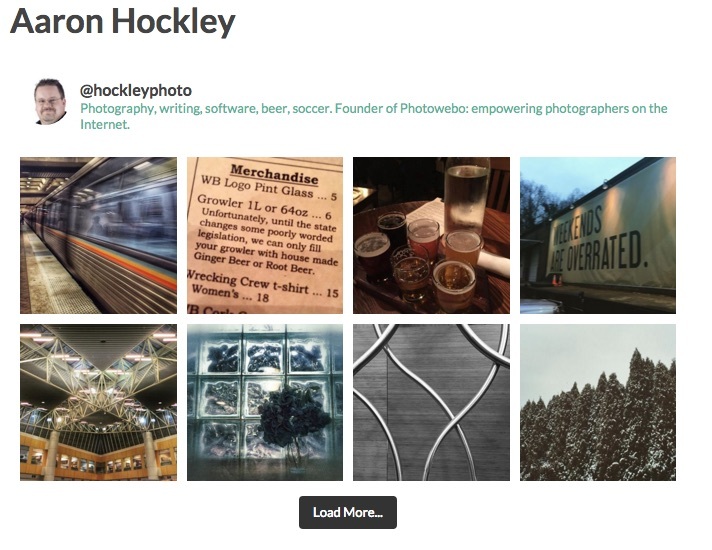 Display of Aaron Hockley’s Instagram photos with the Instagram Feed shortcode set to four across. Instagram’s visual content and story-based culture allows you to humanize your Brand. We all want to feel connected, right? I believe this Instagram feed allows you to level up your website. Instagram Feed is a great plugin that both performed well and met my expectations. It’s time to go Gramming!